I am glad that you have been writing about the air pollution problems in Chiang Mai because I also believe the air is very polluted and unhealthy. I have called the city’s 24-hour air pollution call center 3 times. During the first 2 calls, I reported the burning of trash at the New Asia Hotel on a soi off Rajchawong Street (address 55 Rajchawong) in the center of Chiang Mai. The New Asia Hotel burns wood ALL DAY in its furnace supposedly to heat water for the hotel. Once or twice a day they burn garbage; huge black plumes of noxious, acrid smoke can be seen. The smell of burning plastic and other things spreads over a wide area of the center of the city (Rajchawong, Chang Moi and Sithawong streets). One of the managers at the New Asia Hotel said that they only burned wood. But this is a strange kind of wood that gives off black noxious smoke that smells like burning plastic. 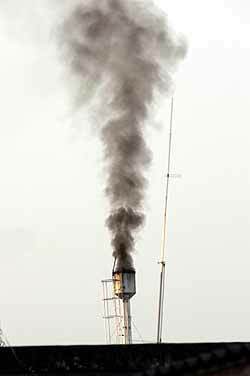 I believe that several others have called about this black smoke. We have contacted both the hotel and the city municipal offices. But the burning continues. The garbage is burned daily around 5.30 – 6 a.m. when it is still dark. But one cannot mistake the noxious odor. Occasionally they do a second burning in the late afternoon (4-6 p.m.). The attached photo was taken about 5.30 p.m. one afternoon and has been sent to the city offices. This industrial pollution in the city center is unhealthy and a major source of air pollution as it is continuous, poisonous and voluminous. The New Asia Hotel dumps into the air large quantities of carbon dioxide, particulates and poisonous gases from the burning of wood and trash. If the city is serious about lowering pollutions levels in the city, it can start by closing this furnace and making sure that the New Asia Hotel uses the city garbage collection service to remove its trash. The city should ‘persuade’ the New Asia Hotel to install a non-wood burning, non-polluting system to heat the hotel water. In response to Grant Waldman’s comments concerning the devious Christians at Payap, I have several observations to make. I did my B.A. at a Baptist university in the U.S. Every student, regardless of race, religion or politics, was required to attend chapel twice a week and had to take Old Testament and New Testament studies! Actually, I think you would find that a typical practice at most Christian affiliated universities. I did my doctoral studies at an American Catholic university, and was barraged by professors and staff wearing clerical garb and using Jesuit curriculum. But I knew that before I signed up, as every student attending Payap knows about chapel attendance before beginning their studies. I have been a faculty member and an administrator of several “Christian” institutions, as well as secular institutions, including Payap. There is no “religious blackmail” going on at Payap. Could you possibly help find any news on a missing friend in Chiang Mai? I have heard he died there sometime between March 18th and March 25. His Name is Gordon Lee Brandt and it may have been reported in a local newspaper. (Editor’s note) If you know anything about the whereabouts of Gordon Lee Brandt, please send an email, fax or letter to [email protected] and we will forward it to Rick Gray.